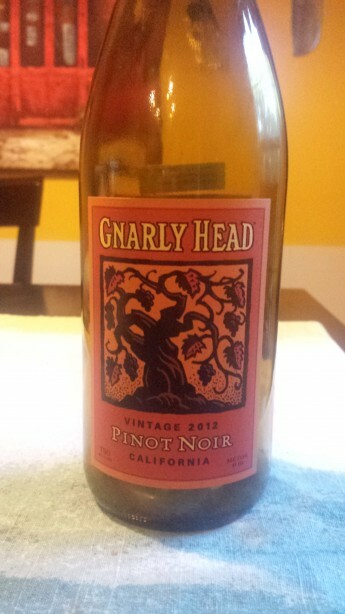 Winemaker’s Notes: Gnarly Head 2012 Pinot Noir takes “the heartbreak grape” for a walk on the wild side. This powerful pinot touts voluptuous aromas of red cherry, vanilla, earth, and spice, followed by a rush of black cherry and plum with hints of toasted hazelnut, tobacco, and cigar box on the palate. Supple, sleek tannins and lush fruit make this wine a perfect pair for salami and arugula pizza, slow roasted pork loin, or dry brined chicken stuffed with sausage and peppers. My Review: It should by this point be no surprise that I’m a big fan of Pinot Noir, especially budget wines that I can enjoy regularly without having to worry about the hit to my wallet. Gnarly Head is one of those wines that I see on the shelf regularly, thank to the wide range of wines that they make, but admittedly don’t often reach for, not because I don’t think they make good wines, but because I know they’re always going to be there and making consistently good wines, which means I always have time to circle back. This time, at least, I didn’t have to circle back since the wines were sent to me. In the glass the 2012 Gnarly Head Pinot Nor was a bit darker than I expected, but still not opaque, with a light red color slashed with darker shades. On the nose I picked up red cherry and spice with a bit of vanilla as the wine opened up. In the mouth the wine was light and tart, with cherry notes carrying over from the nose. Paired with a dinner that included corn, green beans, and breaded and fried chicken, the wine tartness was a nice counter to the food, while the lighter nature of the wine helped keep it from overwhelming the food. That being said, this with some pizza that featured arugula (rocket for my English friends) would be pretty amesome. By no means was this the greatest Pinot Noir made, but for $14 it’s a good budget wine that you can open on a weekday or at a casual party without having to worry. It’s versatile anough to pair with different foods, but enjoyable enough on its own that you won’t always have to. Definitely worth a pick up.